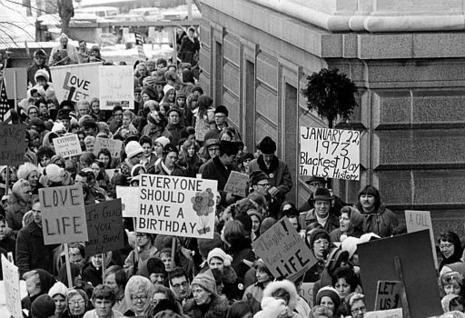 Roe v. Wade, 410 U.S. 113 (1973), a landmark case decided by the United States Supreme Court on the issue of abortion, is one of the most controversial and politically significant cases in U.S. Supreme Court history. The court issued its decision on January 22, 1973, with a 7 to 2 majority vote in favor of McCorvey. Burger and Douglas' concurring opinion and White's dissenting opinion were issued separately, in the companion case of Doe v. Bolton. The Roe Court deemed abortion a fundamental right under the United States Constitution, thereby subjecting all laws attempting to restrict it to the standard of strict scrutiny. Although abortion is still considered a fundamental right, subsequent cases, notably Planned Parenthood v. Casey, Stenberg v. Carhart, and Gonzales v. Carhart have affected the legal standard. The opinion of the Roe Court, written by Justice Harry Blackmun, declined to adopt the district court's Ninth Amendment rationale, and instead asserted that the "right of privacy, whether it be founded in the Fourteenth Amendment's concept of personal liberty and restrictions upon state action, as we feel it is, or, as the District Court determined, in the Ninth Amendment's reservation of rights to the people, is broad enough to encompass a woman's decision whether or not to terminate her pregnancy." Douglas, in his concurring opinion from the companion case Doe v. Bolton, stated more emphatically that, "The Ninth Amendment obviously does not create federally enforceable rights." Thus, the Roe majority rested its opinion squarely on the Constitution's due process clause. The majority opinion is organized into twelve sections preceded by a brief preface; the first four sections provide background. Section I briefly outlines the challenged Texas abortion statutes. Section II characterizes the factual and procedural backgrounds of Jane Roe's and Mary Doe's litigation, including the District Court's rulings regarding the procedural questions (here, justiciability, standing, and abstention) and the merits (here, the requests for declaratory judgment and injunctive relief). Section III is a single paragraph resolving that under the law of Federal Court procedure, the opinions in Mitchell v. Donovan and Gunn v. University Committee do not foreclose review a case of this kind when it is properly here on appeal under § 1253. Section IV issues the court's decision on the procedural questions described in Part II. Section VI surveys the history of abortion regulations, in eight subparts: 1. Ancient attitudes (including those of the Persian Empire, Greek times, the Roman era). 2. The Hippocratic oath. 3. The common law. 4. The English statutory law. 5. The American law. 6. The position of the American Medical Association. 7. The position of the American Public Health Association. 8. The position of the American Bar Association. According to the Roe Court, "the restrictive criminal abortion laws in effect in a majority of States today are of relatively recent vintage." Prior to 1821, when Connecticut passed the first state statute criminalizing abortion, abortion in the United States was sometimes considered a common law crime. Every state had abortion legislation by 1900. However, the court concluded that it could not find a sufficient historical basis to justify the Texas statute. In Section VII, the Court identified three state interests that could be cited to justify criminalizing abortion: (1) an interest in discouraging women from engaging in "illicit sexual conduct", which interest would be undermined by making abortion widely available; (2) an interest in reducing access to a risky medical procedure—which abortion could still be in the late stages of pregnancy, despite modern medical techniques such as antibiotics; and (3) an interest in protecting prenatal life. Blackmun rejected the first interest out-of-hand, writing that "no court or commentator has taken the argument seriously" and that in any event it could not be cited in support of this statute, which failed to "distinguish between married and unwed mothers". Accordingly, the only valid state interests are reducing medical risk and protecting prenatal life. (In Section X, the Court reiterated, "[T]he State does have an important and legitimate interest in preserving and protecting the health of the pregnant woman [and] still another important and legitimate interest in protecting the potentiality of human life.") Thus, "arguments that Texas either has no valid interest at all in regulating the abortion decision, or no interest strong enough to support any limitation upon the woman's sole determination, are unpersuasive". In Section VIII, the Court also identified a countervailing right that would have to be weighed against these state interests: namely, a Constitutional right to privacy: "We, therefore, conclude that the right of personal privacy includes the abortion decision, but that this right is not unqualified and must be considered against important state interests in regulation." The innovation of the Roe court was to locate this "right of privacy" in the due process clause of the Constitution. Although the Constitution does not explicitly mention any right of privacy, the Court had previously found support for various privacy rights—directly (in several provisions of the Bill of Rights and the Fourteenth Amendment) as well as indirectly (in the "penumbra" of the Bill of Rights) -- most recently in Griswold v. Connecticut. In Section IX, the Court added that there was no legal grounds for factoring into this balancing test any right to life of the unborn fetus. The fetus would have such a right if it were defined as a legal person for purposes of the Fourteenth Amendment, but the original intent of the Constitution (up to the enactment of the Fourteenth Amendment in 1868) did not include protection of the unborn. The Court emphasized that its determination of whether a fetus can enjoy constitutional protection neither meant to reference, nor intervene in, the question of when life begins: "We need not resolve the difficult question of when life begins. When those trained in the respective disciplines of medicine, philosophy, and theology are unable to arrive at any consensus, the judiciary, at this point in the development of man's knowledge, is not in a position to speculate as to the answer." Section X explained that the trimester of pregnancy is highly relevant to the weight of the factors in this balancing test. Thus, during the first trimester, the state cannot restrict a woman's right to an abortion in any way; during the second trimester, the state may only regulate the abortion procedure "in ways that are reasonably related to maternal health"; during the third trimester, the state can choose to restrict or proscribe abortion as it sees fit when the fetus is viable ("except where it is necessary, in appropriate medical judgment, for the preservation of the life or health of the mother"). Section XI succinctly summarizes the Court's legal conclusions, explaining that a Texas-style criminal statute was unconstitutional, and recapitulating the permissible extent of state regulation in each of the three Constitutionally relevant time periods of pregnancy (i.e. divided by "approximately the end of the first trimester" and "the stage subsequent to viability"). Section XII resolves the present dispute: it struck down the Texas statute and characterized the relief that should be accorded to Roe.